Two-way radio systems usually operate in a half-duplex mode; that is, the operator can talk, or he can listen, but not at the same time. A push-to-talk or Press To Transmit button activates the transmitter; when it is released the receiver is active. A mobile phone or cellular telephone is an example of a two-way radio that does both transmits and receives at the same time,i.e., in full-duplex mode. Full-duplex is generally achieved by the use of two different frequencies or by frequency-sharing methods to carry the two directions of the conversation simultaneously. Methods for mitigating the self interference caused by simultaneous same-frequency transmission and reception include using two antennas, or dynamic solid-state filters. Early two-way schemes allowed only one station to transmit at a time while others listened, since all signals were on the same radio frequency – this was called "simplex" mode. Code and voice operations required a simple communication protocol to allow all stations to cooperate in using the single radio channel, so that one station's transmissions were not obscured by another's. By using receivers and transmitters tuned to different frequencies, and solving the problems introduced by operation of a receiver immediately next to a transmitter, simultaneous transmission and reception was possible at each end of a radio link, in so-called "full duplex" mode. The first radio systems could not transmit voice. This required training of operators in use of Morse code. On a ship, the radio operating officers (sometimes shortened to "radio officers") typically had no other duties than handling radio messages. When voice transmission became possible, dedicated operators were no longer required and two-way use became more common. Today's two-way mobile radio equipment is nearly as simple to use as a household telephone, from the point of view of operating personnel, thereby making two-way communications a useful tool in a wide range of personal, commercial and military roles. Simplex channel systems use a single channel for transmit and receive. This is typical of aircraft VHF AM, Citizens Band and marine radios. Simplex systems are often legacy systems that have existed since the 1930s. The architecture allows old radios to work with new ones in a single network. In the case of all ships worldwide or all aircraft worldwide, the large number of radios installed, (the installed base,) can take decades to upgrade. Simplex systems often use open architectures that allow any radio meeting basic standards to be compatible with the entire system. Time delay is always associated with radio systems, but it is apparent in spacecraft communications. NASA regularly communicates with exploratory spacecraft where a round-trip message time is measured in hours (like out past Jupiter). For Apollo program and Space Shuttle, Quindar tones were used for transmit PTT control. Though the general life term for the two way radio is 5 to 7 years and 1 to 2 years for its accessories but still the usage, atmosphere and environment plays a major role to decide its life term (radios are often deployed in harsh environments where more fragile communication equipment such as phones and tablets may fail). There are so many speculations on the life term of two way radios and their accessories i.e. batteries, chargers, head set etc. Two-way radios can operate on many different frequencies, and these frequencies are assigned differently in different countries. Typically channelized operations are used, so that operators need not tune equipment to a particular frequency but instead can use one or more pre-selected frequencies, easily chosen by a dial, a pushbutton or other means. For example, in the United States, there is a block of 5 channels (pre-selected radio frequencies) are allocated to the Multiple Use Radio System. A different block of 22 channels are assigned, collectively, to the General Mobile Radio Service and Family Radio Service. The Citizens Radio Service (""CB"") has 40 channels. A channel number is just a shorthand notation for a frequency. It is, for instance, easier to remember "Channel 1" than to remember "26.965 MHz" (US CB Channel 1) or "462.5625 MHz" (FRS/GMRS channel 1), or "156.05 MHz" (Marine channel 1). It is necessary to identify which radio service is under discussion when specifying a frequency by its channel number. Organizations, such as electric power utilities or police departments, may have several assigned frequencies in use with arbitrarily assigned channel numbers. For example, one police department's "Channel 1" might be known to another department as "Channel 3" or may not even be available. Public service agencies have an interest in maintaining some common frequencies for inter-area or inter-service coordination in emergencies (modern term: interoperability). 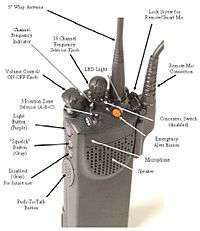 The most common two-way radio systems operate in the VHF and UHF parts of the radio spectrum. Because this part of the spectrum is heavily used for broadcasting and multiple competing uses, spectrum management has become an important activity of governments to regulate radio users in the interests of efficient and non-interfering use of radio. Both bands are widely applied for different users. There are more available channels with UHF. Since the range of UHF is also not as far as VHF under most conditions, there is less chance of distant radios interfering with the signal. UHF is less affected than VHF by manmade electrical noise. So as you see, radio technology is very dynamic and you must make the choice of what to use based on your individual situation. The useful direct range of a two-way radio system depends on radio propagation conditions, which are a function of frequency, antenna height and characteristics, atmospheric noise, reflection and refraction within the atmosphere, transmitter power and receiver sensitivity, and required signal-to-noise ratio for the chosen modulation method. An engineered two-way radio system will calculate the coverage of any given base station with an estimate of the reliability of the communication at that range. Two-way systems operating in the VHF and UHF bands, where many land mobile systems operate, rely on line-of-sight propagation for the reliable coverage area. The "shadowing" effect of tall buildings may block reception in areas within the line-of-sight range which can be achieved in open countryside free of obstructions. The approximate line-of-sight distance to the radio horizon can be estimated from : horizon in kilometers = 3.569 times the square root of the antenna height in meters. ↑ Goldsmith, Andrea (8 Aug 2005). Wireless Communications. Cambridge University Press. ISBN 9780521837163. Retrieved 20 April 2016. ↑ Duarte, Melissa; Sabharwal, Ashutosh (2010). "Full-Duplex Wireless Communications Using Off-The-Shelf Radios: Feasibility and First Results" (PDF). WARP Project. Retrieved 20 April 2016. ↑ Choi, Charles Q. "Chip Could Double Wireless Data Capacity". IEEE Spectrum. Retrieved 20 April 2016. ↑ One example of purpose-specific channel assignments is described in Ivanov, D. A., V. P. Savelyev, and P. V. Shemanski, "Organization of Communications," Fundamentals of Tactical Command and Control: A Soviet View, Soviet Military Thought Series #18, (Washington, D.C.: Superintendent of Documents, 1977) Library of Congress Control Number: 84602565. This is a US Air Force translation of a Soviet-era, Russian-language book. See also, "Inadequate System Capacity," Special Report: Improving Firefighter Communications, USFA-TR-099/January 1999, (Emmitsburg, Maryland: U.S. Fire Administration, 1999) pp. 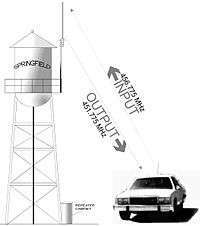 18-19 and "5.2 Present System," The California Highway Patrol Communications Technology Research Project on 800 MHz, 80-C477, (Sacramento, California: Department of General Services, Communications Technology Division, 1982,) pp. V-4 - V-6. ↑ "3.4.1 User Equipment General Deficiencies," San Rafael Police Radio Committee: Report to Mayor and City Council, (San Rafael, California: City of San Rafael, 1995,) pp. 12. ↑ For an example of talk around use, see "Problem Reporting," Special Report: Improving Firefighter Communications, USFA-TR-099/January 1999, (Emmitsburg, Maryland: U.S. Fire Administration, 1999) pp. 25-26. This article also confirms the definition of the phrase talk around. ↑ For examples, see, Mikhailov, K. E. "Communications Facilities on the Volga-Moscow Transmission Line," Long-Distance Electrical Transmission between the V. I. Lenin Hydroelectric Station and Moscow, (Jerusalem: Israeli Program for Scientific Translations, 1965). ↑ For an electrocardiogram telemetry example, see Planning Emergency Medical Communications: Volume 2, Local/Regional-Level Planning Guide, (Washington, D.C.: National Highway Traffic Safety Administration, US Department of Transportation, 1995) pp. 48. ↑ For one example, see: "Plan Element S-7: Rationalized Funding" and "Plan Element L-2: Permanent Contra Costa Public Safety Radio Authority," Contra Costa County Public Safety Mobile Radio Master Plan, (Fairfax, Virginia: Federal Engineering, Inc., 2002,) pp. 45, 49. ↑ For one example, see: "3.2.10.1 Current System Problems," Trunked Radio System: Request For Proposals, (Oklahoma City, Oklahoma: Oklahoma City Municipal Facilities Authority, Public Safety Capital Projects Office, 2000) pp. 56. ↑ "2.4 Equipment Inventory," San Rafael Police Radio Committee: Report to Mayor and City Council, (San Rafael, California: City of San Rafael, 1995,) pp. 8. ↑ "8000 Exhibits:Equipment Replacement Costs for a Typical Three Position CDF Command and Control Center," 8000 Telecommunications Manual, (Sacramento, California: State of California, Department of Forestry and Fire Protection, 2006) Adobe PDF file on console costs. ↑ See, "Appendix B - FCC Regulations," California EMS Communications Plan: Final Draft, (Sacramento, California: State of California EMS Authority, September 2000) pp.38. and Arizona Phase II Final Report: Statewide Radio Inter-operability Needs Assessment, Macro Corporation and The State of Arizona, 2004. ↑ "2-Way Radio Range: How Far Can Two-Way Radios Communicate?"